(POP must be kept to staple with the contest form). Participants are encouraged to fill up the form on the spot and answer questions given. placed on top of the cashier counter. (POP must be kept for verification purpose). Participants need to log on to the contest website www.myguardian.com.my/homemakeover and key in full name, IC number, contact number, email address, purchase amount and receipt number in the given space. Participants to answer 3 questions stated in the website. and Blaze 100 only (excluding Diesel) at any participating Petron Service Station. order for Contestants to be entitled for lucky draw entries. Blaze 95, Blaze 97 and Blaze 100 (excluding Diesel) worth at least RM10 in a single receipt. Participant with most accurate answers and a most creative slogan will be chosen as shortlisted winners. Shortlisted winners will then be requested to participate in the finale. Based on all lucky draw entries received, Petron will then begin to select the required number of Contestants (“Shortlisted Contestants”). Petron‟s decision on all matters relating to this Contest (including the selection of Shortlisted Contestants) shall be final and binding. No correspondence relating to the selection of winners will be entertained. The Shortlisted Contestant(s) will be contacted either by the Organisers or its appointed representative via phone (the telephone number as available in the Petron Miles database) and is required to answer one (2) Contest question correctly to be qualified as a shortlisted winner. In the event a Shortlisted Contestant is unreachable via phone, the Organisers hereby reserve the right to select another Shortlisted Contestant. 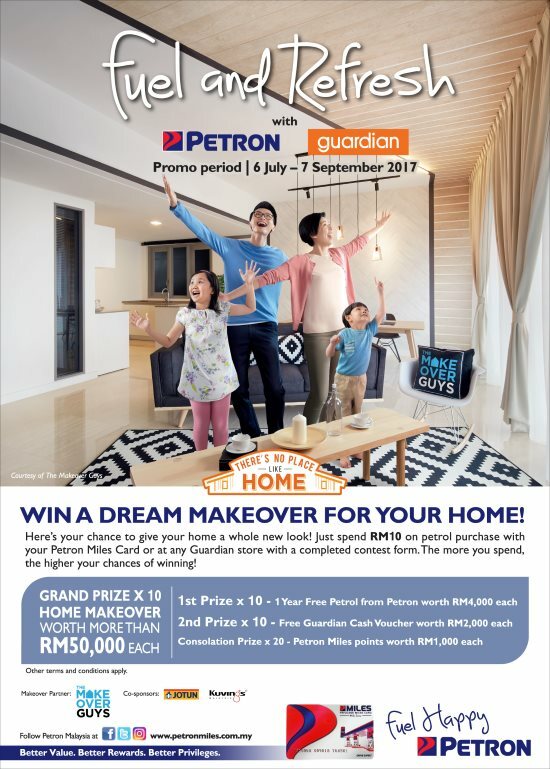 Visit Guardian & Petron Win a Home Makeover Contest terms & conditions for more details.